Limited lifetime warranty on frame and crossframe. 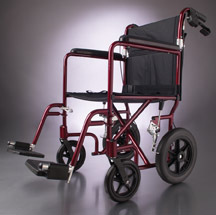 One year warranty on upholstery, wheel lock assemblies, wheels, tires, castors, handgrips, legrests, arms, armpads, handrims, quick release, axles, and any other "wearable" parts. 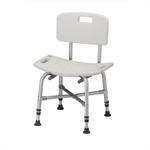 Heavy Duty Bath Bench with Back Aluminum anodized frame * Heavy-Duty blow molded seat * Height adjust: 17in. - 20in. * Seat size: 17in. (W) x 16in. (D) * Seat Height: 21.25in. * Weight Capacity: 500lb.